Mendoza was HOT. 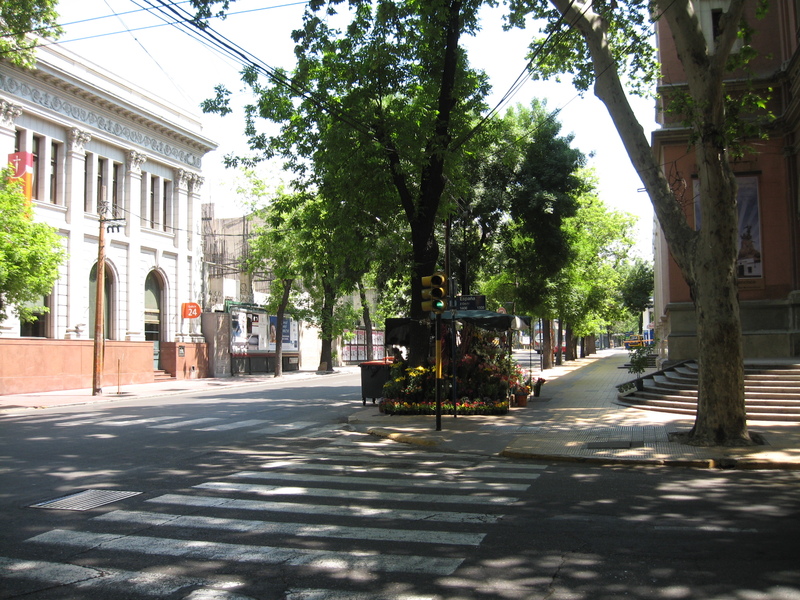 Compared to the coastal areas in Chile where we had been for the last while, Mendoza was nice and warm. Crossing the mountains makes a huge difference. No wonder wine grapes thrive here. Thankfully the town is very flat, so walking it wasn’t too tiring. I encourage stopping at one of the many heladerias (ice cream shops); the oldest of which is Helados Ferruccio Soppelsa. Ice cream is probably Mendoza’s best kept secret. I came for the wine, but I’d stay for the ice cream. Check out this list of Mendoza’s must-eat ice creams. Unfortunately, we made a bad decision when it came to lodgings in Mendoza. We stayed at Hostel Mendoza Lodging (ARS42/$8.50 per person per night), which was, for lack of better words, a dump. The guy who checked us in wasn’t very polite or helpful. We had booked online through HostelBookers, but we didn’t get the room we had requested. Instead we were put in a small, brick, semi-basement closet with a bunk-bed in it. We were told we would be moved into another room the next day. Come the next day, we were put in a four person dorm (with bunk beds). We were not very happy since we had booked a private double room. Breakfast was included, but it was the worst one we’d had at any hostel. It consisted of undrinkable coffee, a glass of powdered orange juice, and toasted buns (which I’m convinced must have been toasted three days prior to them being served to us). These buns, if left uneaten, were then passed around from table-to-table to the next unwitting group of travellers. The next day they did the same thing with plates of stale pastries. Despite the grossness of the hostel, Mendoza itself is delightful. 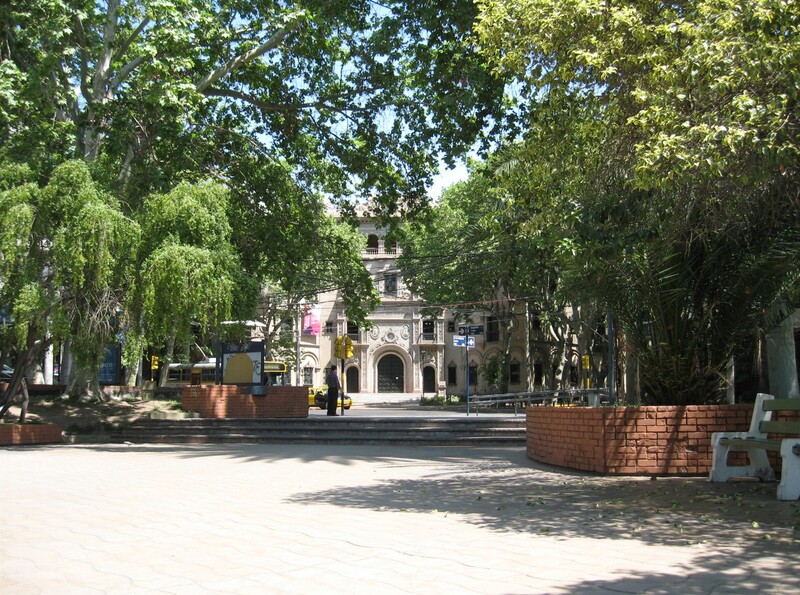 In the centre, there is a main square, Plaza Independencia, around which there are four satellite squares. 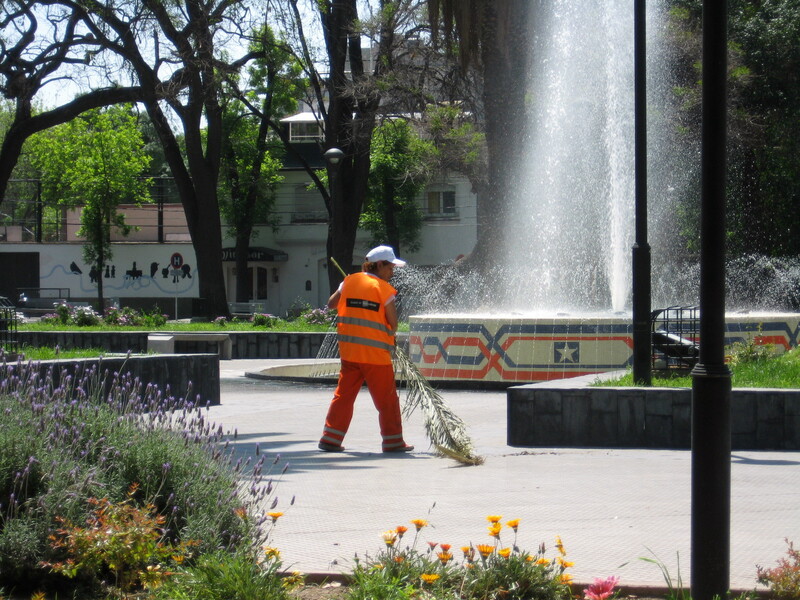 Parque San Martin is located a few blocks to the west, so you are never at a loss for green space. Mendoza is the perfect place to sit with a glass of wine, people watch, relax and enjoy the weather, sit in a park and contemplate how much grilled meat you are going to eat for dinner that night. Making friends with the guy in charge of all the grilled meats! One of the best decisions we made was to go to an all-you-can-eat buffet. We went to Las Tinajas for lunch, and it was easily one of the best food experiences I’ve ever had. They had every kind of meat you could imagine which they would grill on this huge parilla. 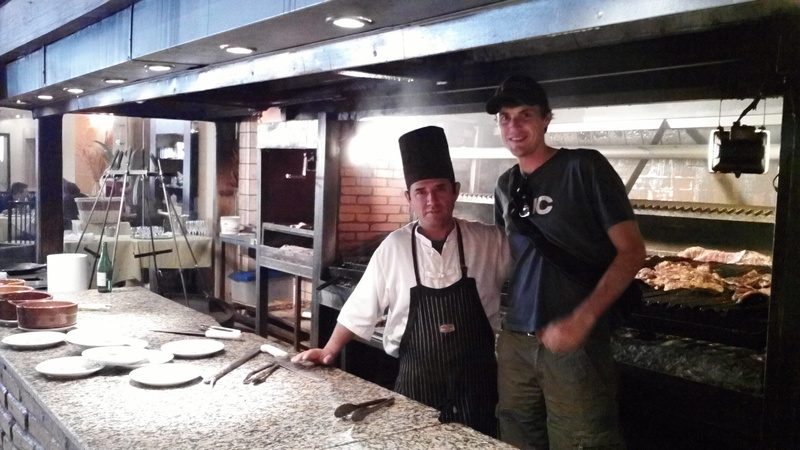 Ryan made friends with the chefs working the parilla and they stacked his plate sky-high with every kind of grilled meat imaginable. There was a pasta chef who would cook up whatever combination of pasta and sauce you wanted, a stir-fry chef cooking up fresh stir-fries to order, vegetables, fruit, and of course dessert. Of course, one can’t leave Mendoza without visiting some wineries. After much contemplation, we decided to visit the Maipu area. Maipu is the closest wine region to Mendoza, and it is possible to rent bicycles and cycle from vineyard to vineyard. We avoided the organized bus/bicycle tours and took a bus to Maipu, and rented bicycles when we got there. Take a 171, 172, or 173 bus from downtown Mendoza to get to Maipu (you need exact change for the machine). In total it cost us ARS35/$7 per person for transport to and from Mendoza and bike rental for the day. We rented our bikes from Mr. Hugo, and we were given a map to the wineries in the area. This website has a list of the bodegas of Maipu. When we returned the bikes, we were given a nice glass of wine to enjoy in the garden before we returned to Mendoza: a nice surprise! Next, we are off to the last stop on our two-month tour of South America, Buenos Aires. We took that bus trip in November, 2011 – loved it! Highly recommend it. Thank you for this. I currently live in Vina Del Mar and am hoping to visit Mendoza in a month. I’m curious, did you have to pay to cross the border into Argentina? I don’t think so — unless it was included in the bus fee. Have fun in Mendoza. You’ll love it there, although Vina Del Mar is hard to beat. I’m gathering notes for our upcoming trip. I’m curious, how much was the all-you-can-eat lunch? It’s strange how accommodations are so cheap and the restaurants all seem so expensive in comparison. I can’t remember exactly, but it was around $6 each plus drinks — a pretty good deal considering how delicious it was. I think Sunday’s are more.